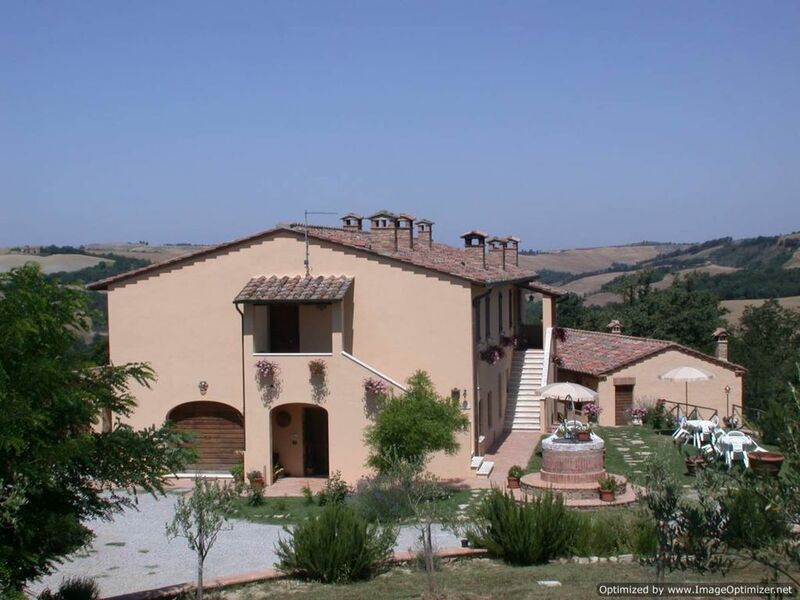 La Coppina is a charming family-run farmhouse surrounded by some of the most spectacular countryside in the Siena area. The property is off of the road that goes from Siena to the pretty village of Asciano (only 10 mins away with shops and restaurants). The winding road of Via Lauretana offers enchanting views of the area. It is also the ideal starting point for day trips to Siena, Montepulciano, Pienza and San Quirico dOrcia. This renovated farmhouse is set on a quiet spot on a hillside, perfect for those looking for peace and quiet. In a panoramic position overlooking the valley, you will find a large shared swimming pool with sun beds and an old barn with a very spacious common room equipped with Satellite TV and a huge fire-place for BBQ. Wi-fi internet connection available for free. In the common room or by the pool during the summer, guests can have breakfast and dinner (to be ordered in advance) and taste the typical Tuscan food, prepared by the owners. The swimming pool (6x12 m  deep 1.20/1.80) is open from May to September. La Coppina offers four tastefully furnished apartments in two renovated houses (the main house and another renovated barn) situated next to each other. All apartments have terracotta floors and beamed ceilings throughout. Saphire apartment is located on the ground floor of the main house and accommodates 4+2. The entrance is in the living area with a sofa bed separated by a half wall from the kitchen. The kitchen is well equipped with a pretty fireplace, stove and fridge with freezer. It has one double, one twin bedroom and a bathroom with shower.